London's Police: Share Intelligence with Muslim Leaders? 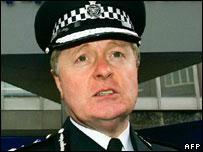 Sir Ian Blair, Commissioner of Police of the Metropolis. London's Commissioner of Police of the Metropolis, Sir Ian Blair, announced (at a conference on "Islamophobia," no less) that his force is considering the idea of sharing intelligence and information with Muslims before launching anti-terror operations, to make them more effective. Nasreen Suleaman reports for the BBC that the police need help, says Sir Ian, in combating extremism and terrorism: "The most single important component in the domestic defeat of terror in the next decade is the ability of the police to work with communities to do just that." To achieve this, he has just appointed a full-time officer, Commander Richard Gargini, to lead the Met's work on community engagement. Gargini explained this new initiative: "What we intend to do is invite selected, influential leaders from the Muslim community to come in and assist us when we are planning and dealing with new information." In some cases, the police would share intelligence with locals and, where necessary, consult them on anti-terror raids in their region. These people, it is hoped, will speak out and reassure others that police actions are proportionate and justified.